Shoowee, what a weekend! Friday evening was a bit of a screw-up. I headed thru to the new house with a few more things in my car. And there I sat and waited for The Trucker. I had an awesome evening in mind, but his work got in the way. it's happening a lot lately and last week was particularly bad. I have high hopes that the person who's starting today will take some of that strain away because for someone who used to be very punctual and reliable (apparently before he owned the Trucks), he really is not lately and it's very frustrating for me. Saturday was such a long day. I was up at 6:30 dismantling the bunny hutch and 2.5hrs later I had cleaned and removed 225 bricks that were the base of the hutch. I'm sure I've probably left about 50 bricks behind, but I simply didn't have the energy for any more! At about 9am, The Trucker got up and CollegeInstructor & ChrisLite came over. The Trucker is an amazing tetris-packer of the 2 bakkies (1 x Corsa, 1 x Mahindra). So we took thru the first load and unpacked it on the other side. Sheesh, it went faster than I thought. ChrisLite had to go to a wedding so went home after the first load. But CollegeInstructor stayed and helped with the next 2 loads we took (with the Mahindra and my little c2). And that was that, everything had been moved by about 15h30. I reassembled the bunny hutch while The Trucker went to drop off CollegeInstructor and then he came back and we put my 4-poster bed back together. 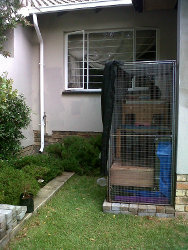 So at least the bunnies & I had a place to sleep :) I was completely exhausted. I didn't let the bunnies out properly today. They were a little traumatised and just wanted to be safe in their hutch, no doubt to reassure themselves. Can you believe The Trucker still found the energy to make it to RR for the Halloween party? I was finished. And I didn't sleep well cause I was so sore. But it was the first night in my new home. I can't explain how much I adore the place. 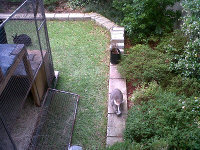 On Sunday morning I was up at 7:30 and the bunnies got their first taste of the new garden. They were completely adorable to watch! Lily was only concerned with the boundary walls. Coal tasted everything! And Rexy wasn't so sure. 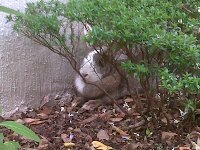 He only came out of the hutch about 10mins after the girls. But they've all settled in really nicely. I think they love it. They came out about 3 times yesterday. Sadly they didn't get a pre-work morning run today tho, they are too hard to herd at the moment with so many plants for them to hide under. Haha. Yesterday I started unpacking. My clothes are all in my cupboard (except for a few things like shoes & scarves). The kitchen is just about all unpacked (except for 1 bag that is mostly tupperware). I started shopping for stuff too, and making a list of stuff I want to buy / do to the place. I really want to rip the entire kitchen out and redo it. It has shelves that are almost completely useless to me because I can't reach to the back of them. And I think it is really badly designed too. And I also now want to redo parts of the bathroom (particularly the bathroom). I've started a little on the garden (ripped out some plants when I made room for the hutch). I really want a bench for the verandah now too. Oh, and I want to redo the cupboard inside & doors in both bedrooms ... And redo the light fittings thruout. Yeah, it's a work in progress. But at least when it's done, it will really be mine :) Although that said, the Council still has not provided the cancellation figures :( Even if I had the cash right now, I'm not doing any of this till transfer goes thru. Oooh, and did I mention how much I am loving having a bath again to relax in? I adore it! Ps. excuse the poor quality photos, I dunno what exactly Blackberry was thinking, but the newer version of their Curve (which I now have) has the most rubbish camera compared with, well anything really, but specifically with their old version of the Curve (which I had before). So yesterday was a bit chaotic. Car Service went smoothly, no unexpected expenses there (Yay! 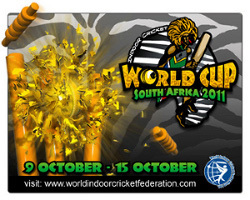 A mere R1000 compared to last year's R6000! Had the breaks done last year ...). Considering how expensive this month has been, I am counting myself lucky (doctors bills, car service and I can only imagine what I'll need to spend on stuff I realise I need after moving). The Trucker got caught up in a work crisis and I ended up having to race off and collect my car and leave his car & keys there for him to collect. And then it was off to The House to collect my new keys. OMG OMG I have the keys to my very own home. The only thing that could've made me happier yesterday afternoon would be if transfer had already gone thru, but the council is still dragging their feet :( *sob* I have high hopes they can get this sorted before the end of Nov! I parked in my new garage and unpacked and spent a little more time just sitting on my verrandah. I adore it. I feel at peace there. Righto, this week. Um, on Monday evening I got bitten by the OMG-I'm-moving-in-mere-days bug and packed just about all remaining stuff. Even the bathroom is all packed except for the stuff I use daily. The only stuff that I haven't come close to is the kitchen and my bedroom (clothes). 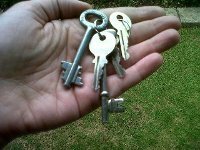 There is a possibility I could be getting the keys this evening, so keep your fingers crossed!! Eep. It all kinda depends on how the car situation goes. This morning I'm driving The Trucker's BMW. He's kindly taken my car in for a service ... because he started listing of things I had to tell them and eventually gave up and just offered to do it himself. A great relief on my part, I promise. But somehow we have to re-swap cars again after the service ... and we're unclear on the exact logistics of this as yet. So it's hard for me to make concrete plans with the current owner (up from Cape Town) to meet up and get the keys as he is here for a work dinner. We have about a 3hr window, so let's hope we can make it happen! OMG. I'm moving this weekend! And it was delish and unbelievably easy to prepare! I decided to try 2 dishes I'd pinned on Pinterest. 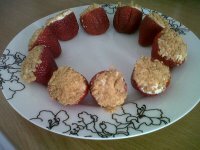 First up, I prepared dessert which waiting patiently in the fridge till after dinner. Dessert was Cheesecake Stuffed Strawberries. Let me tell you, I do not own a paring knife so it was not the easiest thing in the world to take the center out of the strawberries. But Woolies is currently selling hese absolutely mammoth ones, which made it a little easier because it really was like de-coring them. Also I replace the Graham Cracker crumbs with Tennis Biscuit crumbs. and just used a spoon to fill the strawbs. These looked so impressive and tasted quite amazing! 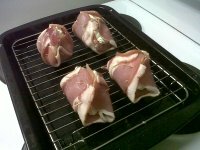 Dinner was Bacon Wrapped Chicken with a Cream Cheese filling. I served this with Woolies Mediterranean veggies. I may have used a little too much cream cheese, and not flattened the chicken quite enough. And I cooked it for only 30mins. But it came out perfectly. I have a left-over one for lunch today - yay. I think I might try these with the smaller chicken strips another time. These also looked completely impressive (that's a before photo)! Can't wait to introduce them to their new home this weekend. So exciting! The nameless and beautiful narrator of The Gargoyle is driving along a dark road when he is distracted by what seems to be a flight of arrows. He crashes into a ravine and wakes up in a burns ward, undergoing the tortures of the damned. His life is over - he is now a monster. But in fact it is only just beginning. 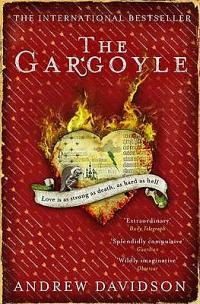 One day, Marianne Engel, a wild and compelling sculptress of gargoyles, enters his life and tells him that they were once lovers in medieval Germany. In her telling, he was a badly burned mercenary and she was a nun and a scribe who nursed him back to health in the famed monastery of Engelthal. As she spins her tale, Scheherazade fashion, and relates equally mesmerising stories of deathless love in Japan, Greenland, Italy and England, he finds himself drawn back to life - and, finally, to love. I didn't have any great expectations of this book when I started, but I absolutely loved it. Although I can't pin point why exactly, I plowed thru it and was absolutely captivated by the story. Yip, I had another weekend away :) Sheesh, but it was further than we thought. And we left about 2hrs later than we intended to (The Trucker was waiting for the Pajero to get fixed by the mechanic who didn't seem to have any sense of urgency). Eventually we set off at about 3pm. And it was a good 5hr drive to Nxala Ranch near Dundee. We arrived in the dark. There were 4 other guests sharing the lodge with us for Friday night and they'd decided to wait for us to arrive before eating dinner. So after offloading our bags, we sat down to a 3 course meal and then it was off to bed after an exhausting drive. Anyway, after a delish breakfast on Saturday morning (we had got a Dinner, Bed & Breakfast option from St Luke's Auction) the other guests set off for their next destination and we headed out to explore the Battlefields region a little. I'll admit my knowledge of the Anglo-Zulu war is (still) pretty minimal. But it was interesting to visit Rorke's Drift and Isandlwana. After that, it was off to Dundee to get some provisions for lunch and then back to the Ranch for a relaxing afternoon. Later in the early evening we took the Pajero out and went to find their san rock paintings (which are barely discernible anymore). And then we just generally drove around the farm looking at the cows & game and enjoyed a gorgeous sunset. 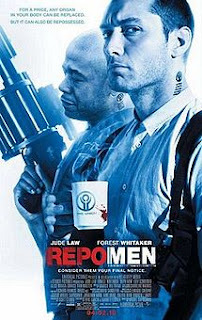 We watched Repo Men after dinner, which The Trucker had already seen, but I hadn't. I wasn't that blown away by it, but you could tell they really thought they had a good twist at the end. I thought it fell rather flat, actually. So Tuesday evening was SCM. And we were shocked to hear some awesome news from @Thunderkitty6 ... who'd just arrived back from a week in Zanzibar. She'd got married! She & her new hubby did an amazing job of keeping everything quiet cause they'd been planning for about 4months and even their folks didn't know till they landed back in SA! On Wednesday I had a "Doctor Day". 3 visits in 1 day, with a big book to keep me company in the waiting rooms. Had a "surprise" biopsy of my fibroadenoma. Not nearly as bad as the Prof implied, but still the sound of a staple gun was a little unnerving. Luckily I haven't had any pain at all. Yesterday evening I popped round to @samanthaperry's new flat for what turned into a girly evening of trying on dresses (by @clairam), hearing @Thunderkitty6's wedding story, with wine and pizza and girl-talk :) Was an awesome last-minute evening. And today is only a half day (thank goodness, this has been a very long week) cause The Trucker & I are off to Dundee for the weekend :) Yay. Everyone hates the perfect family. So you'll love the Battles. Mo is about to hit the big 50, and some uncomfortable truths are becoming quite apparent: She doesn't understand either of her teenage kids, which as a child psychologist, is fairly embarrassing. She has become entirely grey. Inside, and out. Her face has surrendered and is frightening children. Dora is about to hit the big 18 ...and about to hit anyone who annoys her, especially her precocious younger brother Peter who has a chronic Oscar Wilde fixation. Then there's Dad ...who's just, well, dad. A Tiny Bit Marvellous is the story of a modern family all living in their own separate bubbles lurching towards meltdown. It is for anyone who has ever shared a home with that weird group of strangers we call relations. Oh and there's a dog called Poo. Oh wow. Yesterday was just dismal. Actually, I was having a pretty good day till about 3pm. And then I phoned Telkom. Sigh. I'd ordered the move of my phone line and received an sms from them last week that didn't sound promising, but it wasn't till I called them for clarity yesterday afternoon that I discovered how dire the situation actually is. Basically there is NO infrastructure left in the area I'm moving to ... which means that unless someone cancels their phone line (and I happen to be top of the waiting list), there is no chance of me getting a phone line. I'm guessing Ever. Their official line is "till their next financial year" (which is March 2012). Practically yes, I guess I can believe it. But what sort of service are you offering that is not scalable and that you actually can not provide. I was also told that from now on I will have to call Telkom each month to get them to credit my account with the amount they'll automatically keep billing me for services I don't receive. Excellent :P What a fantastic service model Telkom. Seriously. I was completely livid. I just can not stand these situations that affect my life but are completely out of my control. So I guess (when I calm down and stop hating Telkom and being angry and frustrated to the point of tears), I'll be looking for alternative solutions. But I am *not* happy about that. At. All. I don't want 3G, I don't like the idea of 3G. I like my permanent ADSL connection. Sigh. It ruined my *entire* day and has definitely removed some of my enthusiasm for moving. I like things to run smoothly. And then there was just thing after thing of people letting me down or service providers not providing (2 more things happened before 6pm). I was flattened. I made myself (actually a quite yummy) dinner and then climbed into bed with my book to escape the day. Well, we had another pretty awesome weekend :) Lots of variety and not that much relaxing. Friday night wasn't that great, honestly. I headed off to The Trucker's house but he had some work still to do (truck-stuff that involves driving around to deliver 2 new tyres and pick up stuff from the mechanic and what not). Which I basically just tagged along for the drive. 2hrs later we were pretty exhausted and plowed thru some Chinese take-out and went to bed. On Saturday morning he brought the Fluffies over (he was dog-sitting cause his ex was away for the weekend). And after playing with them for a bit, we headed off to breakfast. We went for breakfast at Cafe Rossini in Cresta and did some shopping. Then it was a race to dinner because the men's final started late. I went home to let the bunnies run for a bit and have a shower after sitting in the sweltering arena. The Trucker headed home to feed the Fluffies and take them for a quick walk before heading to my house. Then it was off to @zoosev's for dinner with some friends from work. We had a delish dinner and played a few rousing games of 30 seconds (I always find that helpful when the boys hardly know each other and are too quiet to make conversation with each other easily). We left after midnight, only to arrive home and discover I had no electricity :( So I quickly grabbed some clothes and we headed back to The Trucker's. On Sunday we went to Doppio for breakfast before heading to The Trucker's LSM cricket game. Sheesh it was a hot day for cricket! We got our grocery shopping out of the way before having a bit of a Sunday afternoon snooze. And then it was off to DJMike&his girlf's for a "Make your own Pizza" evening. OMG the pizza's were divine! It was good, but quite exhausting. Am looking forward to a weekend away this weekend :) And then next weekend is moving weekend. Eep!! But this morning is different, this morning all is right with the world. Blackberry Internet Services are working again, I had a lovely night out last night and woke up next to my darling boyf this morning and I am all dressed up and wearing a suit today. 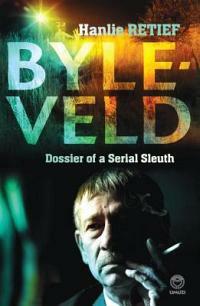 Recently retired, detective Piet Byleveld's name has become legendary. He is the man who solved some of South Africa's most famous crime investigations, including the Leigh Matthews kidnapping. He has a 100% success rate with serial murders. In this book, Rapport journalist Hanlie Retief, who had exclusive access to Byleveld's dossiers, writes about twenty of the most notorious serial-killer cases and many other murders Byleveld solved. She weaves into it the story of Byleveld's own life. The book includes full-colour photographs from police records throughout. So this is the book I bought from the dinner I went to with @WhizBangLouLou. I've just got round to reading it now because The Trucker borrowed it first. I ploughed thru it in 2 days. It was an easy and fascinating read. Honestly. I had no idea South Africa was so high up there on the Serial Killer list ... I mean we watch all these tv shows and movies set in America and I guess somehow I always associate most Serial Killers with there. But after reading this I know we could have our own tv show or movie. Hmmm, I dunno about this one. I mean it's okay. But I don't think I'm a big fan of straight story-line books, honestly. You know what I mean, those this happened, and then this happened, and then this happened, the end. I definitely preferred Haddon's first book, The Curious Incident. It was generally a pretty good weekend :) Friday started it very well. The Trucker & I didn't really have any plans for the weekend yet, but I got a message on Friday afternoon telling me that we now had plans for that evening. Oh really, I asked, and what are we doing. Apparently it was a surprise. And it really was! Sometimes he get's it completely right :) He picked me up at 7pm and told me that it was far away and that we needed to get dinner before. Well now I was completely confused because I had just assumed we were going out for dinner. They offer a 5 course set menu (which changes often, apparently) and all their own wine (which was quite good). The restaurant is not that big, but it felt cosy. I find it's location quite bizarre tho! The food was fantastic and the wait-staff were very helpful and attentive. I would highly recommend a visit. On Saturday we had a bit of an unsuccessful admin morning and a very lazy afternoon. But it was one of those days where whenever The Trucker had some peace and quiet some work thing would interrupt. I don't think he was in a very good mood. Poor boy. In the evening we just got some Indian take-out and headed for his couch. We watched Easy A (now this is exactly the sort of movie I leave for dvd!). Which was good, light, no-thinking entertainment, just what we needed. And then we watched Russell Peter's Red, White and Brown which was quite entertaining. After that there was some general admin running around that The Trucker had to do before dropping me at home and heading to cricket. I went and did some grocery shopping, and some shopping for my Santa's Shoebox. And had a snooze and cleaned the bunny hutch. And then I was in a truly bizarre mood. You know the one where you are just completely unsettled and unable to make any concrete decisions. Like what to eat although you know you're hungry. And even once you decide what you are in the mood for, 10 mins later you're like "Nah". That mood. Damn, when I get like that I annoy myself so much! Then I really shouldn't be alone so that someone else can make all the important decisions for me instead - haha. And here is the thing, I'm completely out of practice. And we eat completely differently. And I have no idea what he likes. No, that's not entirely true, I know he likes steak. But I don't really ever eat steak, so am completely terrified of cooking it, honestly, because I don't really know how it's supposed to look or taste ... So it was definitely not on the cards for Wednesday because I don't quite feel we're at that "I experimented with dinner, but it was a total failure so we're getting take-out" stage yet ... we simply don't eat home cooked meals often enough for that (terrible I know). And because I don't cook properly for myself (because I'm out so much) it's not like "come on over for dinner, I was making this anyway" kinda thing either (which would take the pressure off a little, I suppose). Except for the fact that I mostly eat either meat-free meals or chicken (which he is not mad about). So anyway, with the pressure on, I hunted down potential recipes (my new favourite food "blog") although I ended up choosing something safe and familiar that I didn't think I could get too wrong. My Spinach & Feta Free-Form Pie (with Bacon) and a Banana Loaf served with Nutella for dessert. (Oh, and I never bake or make dessert ... well, because then I will eat it so it's just safer that way, so that was a daunting enough task in itself). I left work yesterday afternoon and headed to the shops armed with my list. First stop PicknPay, followed by Woolies. My usually shopping trip. But annoyingly, Woolies was lacking in 2 of my required ingredients (okay, one was a nice to have, but one was a you-can't-make-it-without ingredient!). Mkay, I figured I'd head to my next nearest Woolies and see if they had stock (knowing that if they didn't there was yet another, smaller, Woolies to pass on my way home from there). Aaargh. What do you know, this 2nd Woolies had about 40 packets of my nice-to-have ingredient and none of my must-have one. Queue phone-call number 1 to Mom (all cooking experiences tend to have at least 3 phone calls with Mom as I panic) to find out what I could possibly replace it with. At the end of that convo, I high-tailed it across the entire shopping center to the PicknPay inconveniently placed at the opposite end and found my must-have-ingredient and purchased it (along with a quick stop back at the Woolies for my nice-to-have ingredient). Sorted, right? The banana bread looked awesome when I popped it into the loaf-tin and started doing the dishes (at about 6pm). And then I started to wonder about that Bacon. I didn't remember unpacking it from my shopping bags ... I definitely remembered putting it in my basket. Nope it hadn't fallen out in my car on the drive home ... And it turned out not to be on the till slip. The poor packet of bacon is probably lying lonely in some shopping basket back at Pick n Pay. Sigh. So off to the very nearby (small) Woolies we go. Yes folks, I stood at a total of 5 tills in 5 different shops this afternoon alone. OMG. That is surely far too many for one mere evening meal!! At this point I could do nothing but laugh since I had committed to making the recipe and it was going to be perfect. An epic, ambitious and page-turning mystery that will appeal to fans of The Shadow of the Wind, Jonathan Strange and Mr Norrell and The Time Traveller’s Wife. London, 1896. Andrew Harrington is young, wealthy and heartbroken. His lover Marie Kelly was murdered by Jack the Ripper and he longs to turn back the clock and save her. Meanwhile, Claire Haggerty rails against the position of women in Victorian society. Forever being matched with men her family consider suitable, she yearns for a time when she can be free to love whom she choses. But hidden in the attic of popular author – and noted scientific speculator – H.G. Wells is a machine that will change everything. Well I really quite enjoyed this book, it did have some "feel" of The Time Traveler's Wife (and it didn't remind me of Jonathan Strange at all!). I definitely enjoyed the first 2 sections better than the third. We headed out of Francistown (A) early, so early that when we tried to pop in at Woolies or PnP on our way out (for braai supplies at the farm that night), they weren't even open! It was just before 9am. And we drove and drove and drove back to the border crossing at Groblersbrug (B), which was much quicker on the way out of Botswana. And then we decided to toss a coin. Either we could go according to plan and stop at the farm overnight and head back into Jozi the next day or we could drive straight thru, arriving home around 6pm-ish. As much as the farm is a weird experience, belonging to The Trucker's ex-girlf's dad and all, I was kinda all for spending the night there en route home. The week away had been bliss (even tho his phone was recently switched back on now that we were back in SA). And I knew that if we headed straight back to Joburg, the holiday would be over and we'd start faffing with real life stuff. Luckily the coin agreed with me :) Haha. And off to the farm we headed. I wasn't quite prepared for what the evening had in store for me, I won't lie. Turns out the ex-girlf's dad and his wife were headed down to the farm for the weekend and we'd be having dinner with them. Before all that tho, we went off on a gorgeous sun-downer game drive on the other side of the farm and saw many of their (apparently) 25 giraffe. To say dinner that evening was a peculiar experience would be a vast understatement. I won't get into details, but it was pretty damn surreal for me. And to top things off, we had breakfast again with them the next morning before we left (not my idea). Not exactly an experience I will be looking to repeat any time soon. And so, we left the farm after breakfast and finally headed home (C). On Friday evening I headed out to Trabella for a birthday dinner. It was tricky to find because any signage was blocked by construction and parking in that Oxford-Corlett corner is generally a total nightmare. But other than that, I'm definitely planning on taking the trucker back there for pizza again :) Was yummy and it's such a cute little place. Although closed for renovations till 18th Oct. The Trucker didn't come with me, he went out with his friend out from America again. And they headed to The Doors, while I headed home. I did consider joining them, but wasn't really in the mood. Instead I was awake at 6:30am on Saturday morning, letting the bunnies run and eating left-over pizza while watching True Blood in bed. A lovely way to start the day :) At about 10, I showered and dressed and went to The Truckers and the 3 of us braved the chaos at Northgate for some breakfast (crazy!). Just as we were arriving it started storming, which it continued on and off till Sunday night. So Sunday was pretty lazy, ideal take-out and series weather :) It was a pretty perfect Sunday afternoon, honestly.